Lady and the Blog → Deals and Steals → Extreme Couponing → Start Planning Your Coupon Strategy For Next Week: Here’s A CVS Sneak Peek! Start Planning Your Coupon Strategy For Next Week: Here’s A CVS Sneak Peek! 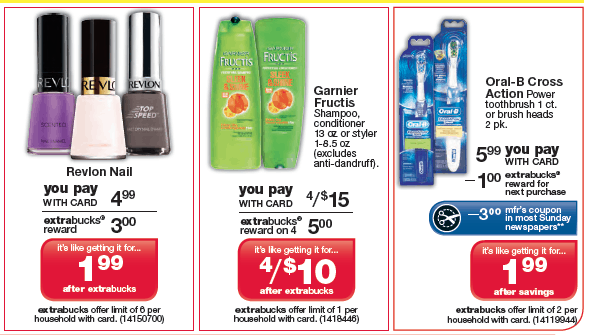 Garnier Fructis – $5 ECB (on 4) = $4/10 BUT if you’ve been saving your newspaper coupons, you have 4 ($1 off) saved. So that makes it $4/6! CVS is also doing a spend $15 and get $5 ECB on Dove or Lever Products. As a reminder, the ads vary by geographical location, especially specific categories such as Food, Beverages, Alcohol, Greeting Cards and Cough and Cold Medication.